Very few objects ever did so much to change the course of Irish history as the fearsome and beautiful Viking longship. In the later-eighth century, Danish and Norwegian shipbuilders developed existing techniques to create vessels that could both traverse the high seas and navigate the great rivers of Europe. The longship was the spacecraft of its day, propelling adventurers across vast and hitherto unimaginable distances. In one raid in 858, a group sailed from Scandinavia to the coast of Spain, into the Mediterranean, on to Italy, up the River Rhône, raiding all the way; and they then sailed home. The Vikings did not invent the techniques that made possible these light, fast ships, but they did perfect them. The method involved splitting oak trunks with axes, chisels and wedges into long,thin and remarkably flexible planks. These were fixed with iron nails to a single sturdy keel and then to each other, with one plank overlapping the next to create the distinctive clinker effect. The low, sleek shape made the ships highly manoeuvrable when steered with a single rudder mounted on the right-hand side of the stern. (This is why the right-hand side of a ship, and now also of an aeroplane, is known as the starboard—i.e. steerboard—side.) The ship’s shallow draught meant that it could be rowed far upriver into the heart of Europe—or, in the case of Ireland, of the island. 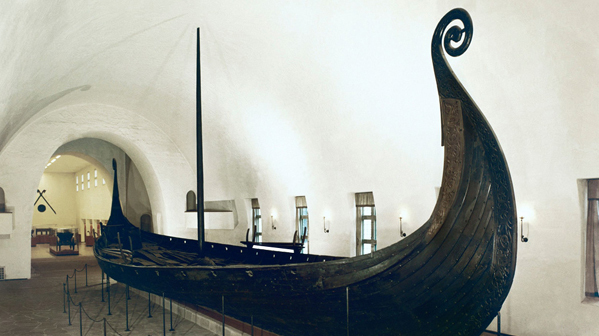 Built c.815, shortly after the Viking raids on Ireland began, the Oseberg ship is more than 22m long and 5m wide. Unlike earlier vessels, which had rowlocks on the gunwale, it has fifteen pairs of oar ports, placed low down so that the oars could strike the water at an efficient angle. Either rowed or sailed (the sail would have covered 90 sq m), it could reach a speed of 10 knots. It is preserved because it was used in 834 to inter a high-status woman in the Oseberg burial mound near the ancient town of Tønsberg in Norway. (Some objects of Irish decorated enamel were found with the burial, perhaps suggesting that the ship’s owners were involved in raids on Ireland.) The prow and the stern, which rise in beautiful curves 5m above the waterline, have carvings of intertwined beasts, whose quality suggest this may have been a royal vessel. The image on the prow is not the dragon so beloved by filmmakers, but a serpent, whose tail is represented in the stern. just great ships, but intrepid sailors.